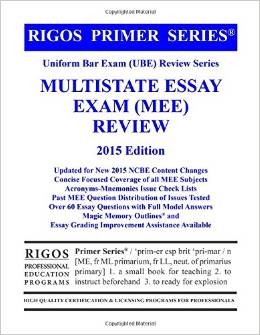 This Rigos program contains all you need to pass the Multistate Essay Exam MEE administered by the National Conference of Bar Examiners (NCBE). Students also benefit from valuable information about the MEE exam, including insights into the essay question historical prior exam frequency and a detailed analysis of the issues tested by subject and exam. This book helps guide your planning session and roadmap for successfully passing the MEE. Included in this book is a succinct explanation of the most frequently tested essay subjects rules. The Rigos text is very concise and focused, containing only the breadth and depth of information you need to answer the MEE essays. Furthermore, hundreds of acronyms-mnemonics and Rigos Bar Review Series tips assist you in memorizing frequently tested legal elements and perfecting your essay approach. Writing style tips and techniques are covered. For each subject, five essay questions are also included with summarized pointer grading guides and full model answers for all NCBE MEE subjects and the six MBE subjects.